Murder by Gaslight: The Poison Fiend. Born Lydia Danbury in Burlington, New Jersey, in 1824, Lydia was orphaned at the age of nine months, and was raised by an uncle. There is nothing in Lydia’s childhood to predict her future murderous behavior. At sixteen she was working as a tailor in New Brunswick, New Jersey, and had joined the Methodist Church. At church she met Edward Struck, a widower with four children, and when Lydia was around twenty, she and Edward were married. They lived happily in New York City and had six children of their own. Their lives changed when Edward Struck, who had been working as carriage blacksmith, took a job on the newly formed, New York metropolitan police force. Struck was called to a disturbance in a New York hotel, and arrived too late to prevent a murder. A rumor began to circulate that Struck had stayed away out of fear for his own life. An inquest was held Struck was dismissed from the police force. Edward Struck became severely despondent after his dismissal, and was unable to hold a job. Eventually he stopped trying to work and was ashamed to even leave the house. He began to act suicidal, and his former boss, a police captain, advised Lydia to send him to a lunatic asylum. Another policeman, a sergeant who lived in the same building, concluded that Struck was out of his mind and would never recover. He advised Lydia to “out him out of the way,” and told her use arsenic, giving her instructions on where to buy it and how much to use. After giving it some thought, Lydia bought some arsenic from a druggist and added a thimbleful to a portion of oatmeal gruel which she gave to her husband. 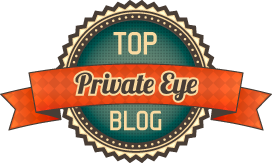 That night Struck became violently ill. A doctor was called, who told Lydia that her husband had “softening of the brain” and would never recover. Struck died at eight o’clock the next morning. Lydia now had four children in the house, and was working as a nurse and seamstress. Her fourteen year old son George was earning $2.50 a week as a painter. When George took sick with “painter’s colic” and could no longer work, Lydia feared he would become a burden. She mixed a little arsenic with his tea. The doctor said George died of painter’s colic. The older children had moved out and now only Ann Eliza was living with Lydia. “Downhearted and much discouraged,” Lydia thought that if she could get rid of Ann Eliza, then she and her oldest daughter Lydia, could make a living together. When Ann Eliza came down with a fever that winter, Lydia added a little arsenic to her medicine. 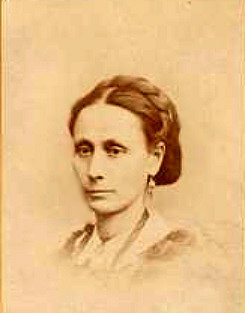 Ann Eliza died four days later. That same winter, her oldest daughter died of natural causes, leaving Lydia all alone. After trying several other occupations, Lydia took a job as a housekeeper for an old woman in Stratford, Connecticut. Eight months later, she left this job for another housekeeping position with an old man named Dennis Hurlburt. Within a few days of her employment, Hurlburt proposed marriage and Lydia accepted. In his will Dennis Hurlburt left Lydia the house and $10,000. She was then approached by Horatio N. Sherman, a widower who was looking for someone to take care of his baby. He soon proposed to her. Though she did not agree right away, she was quite taken with Sherman, and agreed to help him out of debt. They eventually were married but things did not work out as she planned. Sherman turned out to be a hopeless alcoholic who could not be trusted with money. Sherman’s mother-in-law was still living with them and taking care of the baby, Frank. One day Sherman remarked to Lydia that he wished Frank would die so the old woman would have no reason to stay. This made sense to Lydia, who put some arsenic in little Frankie’s milk. She also poisoned Sherman’s fourteen-year-old daughter Ada. Horatio Sherman’s drinking increased. He did nothing to help his family and spent every cent Lydia gave him on liquor. Lydia finally convinced him to join a temperance society and Sherman took a sobriety pledge. He kept the pledge for several weeks, then sold the piano for $300 and went on a binge. Sherman was sick when he returned home a week later. Lydia put arsenic in a bottle of brandy, and the more Sherman drank the sicker he got. When a doctor examined him Sherman said “It may be one of my old spells.” But Dr. Beardsley did not think the symptoms were consistent with alcohol related sickness, and suspected foul play. 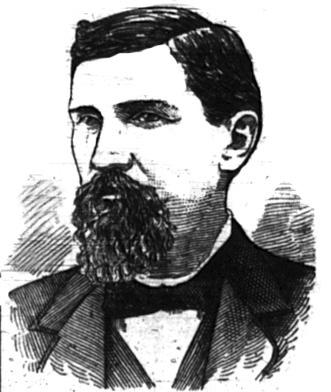 Sherman died the next day and Dr. Beardsley performed a post-mortem examination. Dr. Beardsley’s suspicious were confirmed when Sherman’s stomach was chemically analyzed. Sherman had died of arsenic poisoning and Lydia was charged with his murder. The bodies of Frankie and Ada were exhumed and it was determined that they died of arsenic poisoning as well. Then Dennis Hurlburt was exhumed, and another count of murder was added against Lydia. Lydia Sherman’s trial lasted eight days; it \was well attended and closely followed by newspapers throughout America. The stories often commented on how ordinary Mrs. Sherman looked. The prim and proper forty-eight year old defendant came to court wearing a black alpaca dress, black and white shawl, straw hat, and black kid gloves. She appeared calm and almost cheerful behind her thin lace veil. The defense tried to convince the jury that Horatio Sherman had taken arsenic accidentally, or perhaps had committed suicide, despondent over his financial problems and the recent deaths of two of his children. But the evidence against Lydia was overwhelming. She was found guilty of second degree murder and sentenced to life in prison. If she had been a man (or been tried in a state other than Connecticut) she would likely have hanged. Verdict: Guilty of second degreee murder. While awaiting sentencing, Lydia Sherman dictated her confessions in which she admitted to most of the murders she was accused of committing. The book became a bestseller. 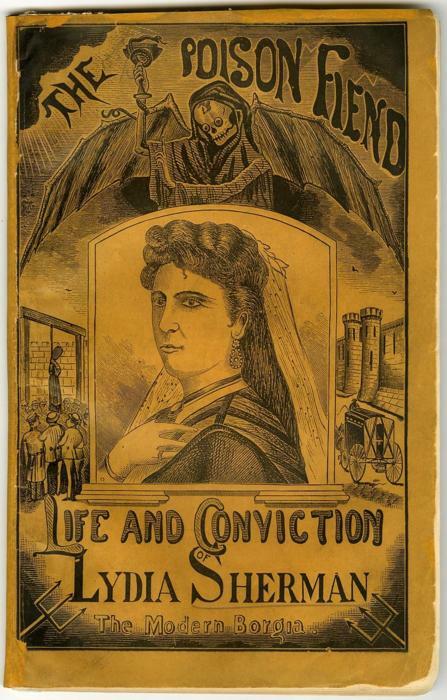 Lydia Sherman died in Wethersfield Prison in 1878. Jones, Ann. Women Who Kill . Britan: Holt, Rinehart, And Winston, 1980. 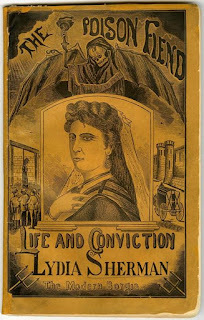 Lydia Sherman: confession of the arch murderess of Connecticut : bloody deeds perpetrated with a cold heart, numerous poisonings, trial and conviction. . Philadelphia: T.R. Callender, 1873. Schechter, Harold. Fatal: The Poisonous Life of a Female Serial Killer . New York: Pocket Star Books, 2003. A Deed to Make Mankind Shudder.